I wish Cult Nails was still around. I think they had some of the most high-quality formulas and colors with their polishes before the indie market became oversaturated. One of my favorite polishes from theirs was Captivated. I loved it so much I got two bottles. Captivated is a coral jelly with golden iridescent glitter. Color: I love this color combination. This is definitely reminiscent of those early 90's jelly shoes. 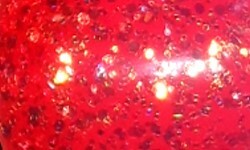 I adore the golden iridescent glitter mixed in there against that bright coral. Formula: This formula is a bit on the thick sign. I do remember it being this way when I originally had it, so it's not from age. I used 3 coats on this and I think adding a bit of thinner could be beneficial to keep it from getting too thick on the nail when building coats. Price: N/A. This has been discontinued as the brand is no longer in business. You might be able to spot this in a destash sale though. Overall: I have so much love for this polish. I love the brightness of the coral and I'm practically drooling over the iridescent glitter. This is a polish that has withstood the test of time as far as appeal goes. This is probably the only time in the history of Imperfectly Painted I'll do this but despite its thick formula it's definitely worth 5 golden paint splatters.